This stereoview card was produced by Webster & Albee Publishers of Rochester, NY in the 1880s (as per card mount style, color and printing), reproducing an 1870s stereo view first issued by Bacon & Carnall. It is perhaps the earliest photographic image of blacks playing baseball. 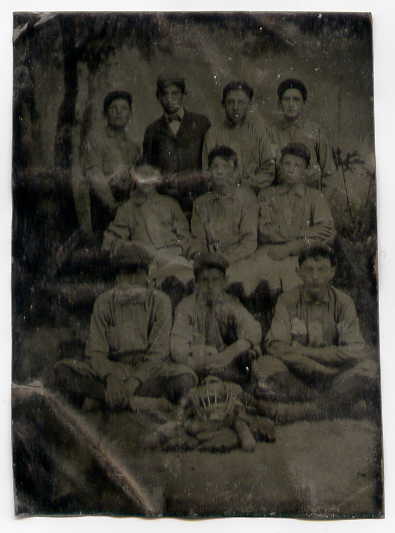 A particularly beaten-up tintype, this specimen depicts a boy's team with their manager, but does nicely display period equipment in the foreground -- including gloves, bats and a catcher's mask. Unsure of exact age. This cabinet photo image is 2 1/4" x 3 3/4" on a 3 1/2" x 5 1/4" mount., with names written on blank back. The photo captures the two before their official MLB careers began. The more distinguished player depicted, Chauncey Fisher, debuted in 1893 with the Cleveland Spiders, going on to play for five seasons for five different Major League teams. The right-handed pitcher played for Cleveland, Cincinnati, Brooklyn, New York and St. Louis , ending his career in 1901. Fisher posted two winning seasons in Cincinnatti and Brooklyn and even pitched for the champion Chicago White Sox in 1900 -- a year before they officially joined Major League Baseball. Fisher's career numbers stand at 21-27, not including his stint with the Chicago White Sox (as the team was not yet part of MLB). 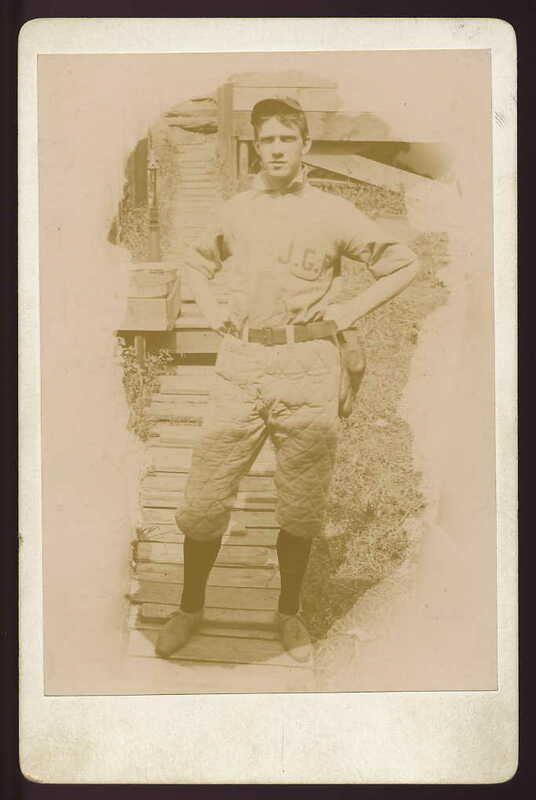 Interestingly, his younger brother, Tom Fisher, played for the 1902 Tigers and 1904 Braves -- making the Fishers one of the earliest brother tandems in professional baseball. This cabinet card was said to have been sold once by Lew Lipset and offered for sale in subsequent auctions by Collectible Classics Auctions and on eBay. 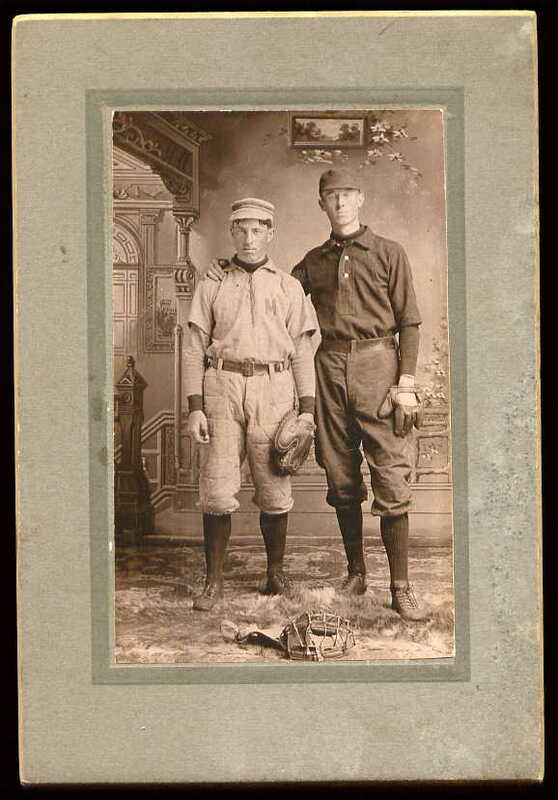 The cabinet photo at right depicts two pre-Major Leaguers -- Chauncey Fisher and George (Paddy) Fox -- who collectively played in the big leagues from 1891 to 1901. While Fisher had the more productive career, Fox is best remembered as one of four Pittsburgh Pirates players traded before the 1900 season for 14 Louisville stars...including Honus Wagner, Rube Waddell, Fred Clarke and Tommy Leach. Pittsburgh also threw in $25,000 to complete the lopsided trade. same facility. 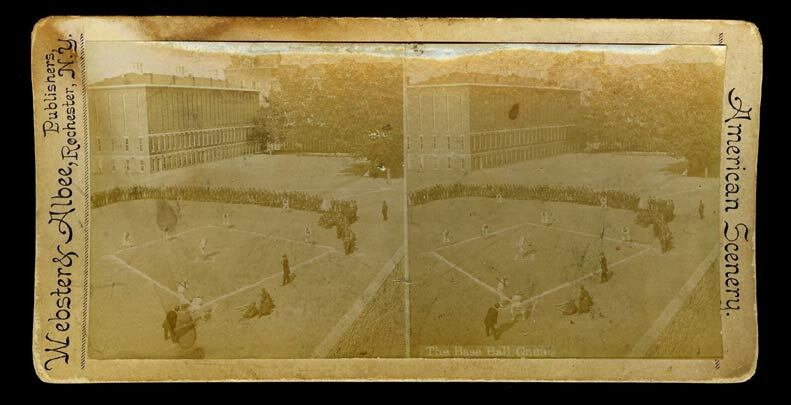 Very rare close-up photos of this same baseball game were also issued in Carte-de-Visite form by the same photographer. The game shown in this card above was a mixed game with both African American and Caucasian players seen on the field. Dark hats were used by the black team, while the jockey style caps were worn by the white boys. Interestingly, Charles R. Webster and Josephus Albee were a major publisher of pirated copies of views. c.1890s cabinet card vignette, showcasing a young ballplayer sporting period quileted pants, a wide belt and glove. His jersey features the letters J.G.R., most likely the initials of a local town team. No photographer name on mount. The reason for this seemingly crazy trade was that Louisville President, Barney Dreyfuss, heard that his team was about to be contracted out of baseball. He quickly sent his best players to the Pirates team, of which he was part owner -- and promptly purchased the team. Paddy Fox, who was born on Tuesday, December 1, 1868, actually had begun his Major League career on July 13, 1891, with the Louisville team of the American Association, before playing for the Pirates and having the distinction of being traded back to a Louisville team for the 1900 season! Fox made brief appearances with Louisville in 1891 as a third baseman and then in 1899 with Pittsburgh as a first baseman and catcher. He left Pittsburgh for Louisville in December 1899 as part of Dreyfuss' deal to bring the nucleus of his Louisville franchise with him to PIttsburgh. Fox hit .200 in 19 Major League games. He played for two seasons on two different MLB teams and ended his playing career with the Colonels after they left the big leagues. This imperial cabinet card demonstrates amazing clarity in its depiction of an unknown team from the 1890s. 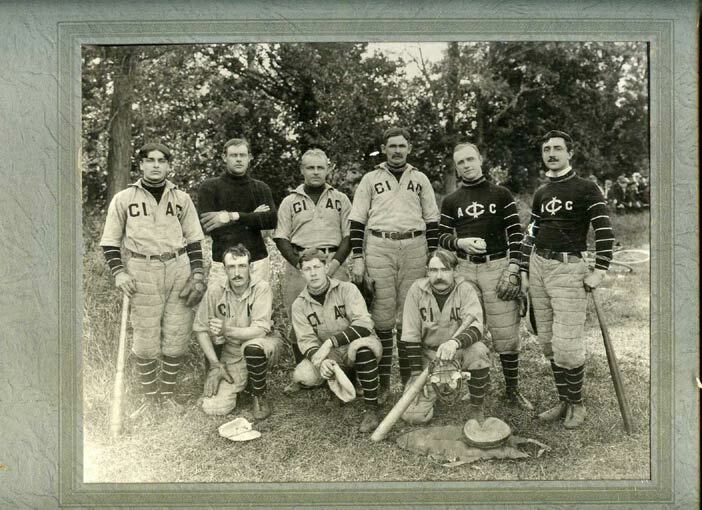 With jerseys emblazoned with the letters CI and AC, this team was likely an athletic club, perhaps from Cincinnatti? Most impressive is the glimpse into baseball histroy through quilted pants, striped socks, painter style caps, an early chest protector and multiple period bats and gloves. A fantastic image of this early nine. 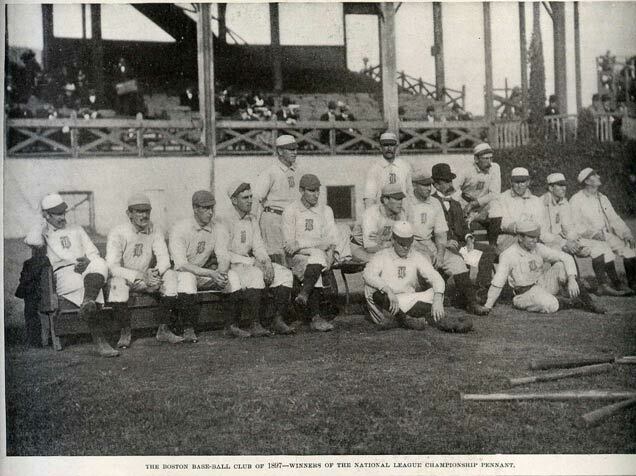 The photo at left, showcasing the 1897 National League champion Boston Beaneaters team, was actually part of a feature page in Leslie's magazine. Although it technically belongs elsewhere in this site, this early image is a great one, worthy of attention in this photographs section. Despite boasting such stars as Jimmy Collins, Hugh Duffy, Kid Nichols, Chick Stahl and Fred Tenney, this team lost the Temple Cup to the famed Baltimore Orioles. And the Beaneaters even had the supprt of Michael 'Nuff Ced' McGreevey and the Royal Rooters!